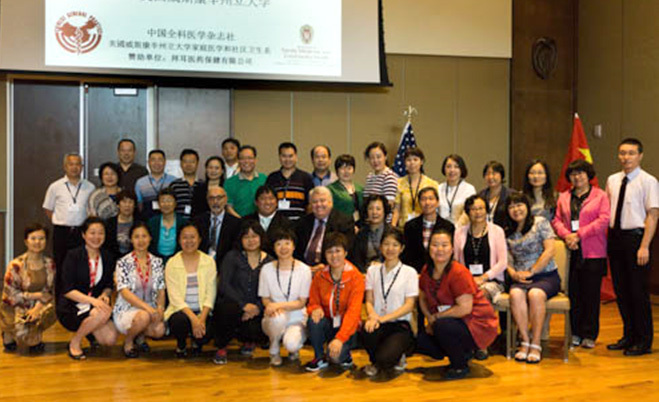 On August 11-14, 2016, the UW Department of Family Medicine and Community Health (DFMCH) welcomed 57 Chinese general-practice (GP) physicians, public health experts and other health professionals in its first-ever U.S.-China Symposium on Family Medicine and Community Health. The symposium was conducted in collaboration with the Yuetan Community Health Services Center in Beijing, with which the DFMCH has had a long-standing exchange program. DFMCH chair Valerie Gilchrist, MD, with Yuetan Community Health Services Center Director Xueping Du, MD, an international leader in Chinese general practice and medical education. 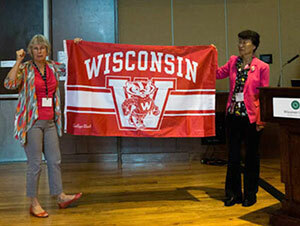 During the symposium, DFMCH faculty and other experts shared their knowledge about family medicine in the U.S. Among them were Kathleen Klink, MD, the graduate medical education affiliations officer at the U.S. Department of Veterans Affairs, who spoke about how American physicians are educated. DFMCH Chair Valerie Gilchrist, MD, gave a presentation on hypertension, DFMCH Professor Richard Roberts, MD, JD, discussed the history of family medicine, and DFMCH fellow Vincent Minichiello, MD, talked about the practice of integrative medicine. The Chinese participants also exchanged ideas—among themselves as well as with their U.S. counterparts—about developments in general practice and community health services in China. In addition, they enjoyed tours of the UW School of Medicine and Public Health, the UW Health Belleville Family Medicine clinic and Madison’s lakeshore trails. For more than half of the attendees, this conference was the first opportunity to directly interact with U.S. family physicians. They had positive impressions of the speakers’ in-depth knowledge and experience in family medicine, and the clinic visits inspired discussions about clinic designs can balance workflow and human needs. “Family medicine (also referred as general practice) is a relatively new specialty in China, but it is one of the cornerstones of government-sponsored health care reforms and initiatives in the Peoples’ Republic,” explained the DFMCH’s Kenneth Kushner, PhD, who coordinated the symposium. The Chinese delegation at the symposium. One of the DFMCH’s key collaborators in the exchange is Xueping Du, MD. Dr. Du is director of the Yuetan Community Health Services Center in Beijing and an internationally respected figure in Chinese general practice and medical education. Other notable presenters from the Chinese delegation were Lizheng Fang, MD, professor and chair of the School of Medicine at Zhejiang University and Shanzhu Zhu, MD, chair of Shanghai Medical College at Fudan University. Dr. Du noted that the conference has not only helped improve participants’ clinical skills, but also advanced their overall service capability. For example, in a recent healthcare skill competition in China’s Xicheng District, the Yuetan Community Health Services Center won by a considerable margin. She added that the exchange program played a critical role in her receiving the World Health Organization’s Sasakawa Health Prize. It was the first time a Chinese GP received this award, which honors outstanding innovative work in health development. Everyone involved in the exchange program hopes to deepen future collaborations through visits, lectures and conferences in both the U.S. and China. “Ideally, the program will produce collaborative research and outcomes, leading to innovations and substantive breakthroughs in healthcare, training and research,” said Dr. Du.